People Are Talking About Switcha Pocket! Cha Cha Cha Change! That’s what the new Switcha Pocket brand is all about! Keeping up with little fashionistas today can befuddle even the most “in” parents, which is why John Lebl, the founder and president of Switcha Pocket, decided to create a collection that caters to modern girls’ ever changing appetite for style without breaking the banks of the parents who feed those cravings! 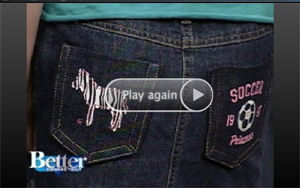 Check out the latest trend in denim for tween girls - an exciting concept in jeans that lets girls create a new pair of jeans every time they wear them!